Megan Corwin lives and works in Seattle, Washington. 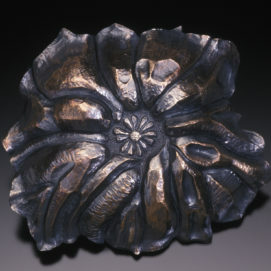 In 1983 she received her MFA in Art Metals at the University of Wisconsin-Madison where she studied with Eleanor Moty and Fred Fenster. Since leaving her position as Head of Jewelry and Metals at the University of Oregon-Eugene in 1994 to have a child, Megan has been teaching workshops and credit classes in metals around the United States. Her area of expertise is chasing and repoussé, and she is currently writing a technical and gallery book on the subject to be published by Brynmorgen Press, Portland, ME in 2009. 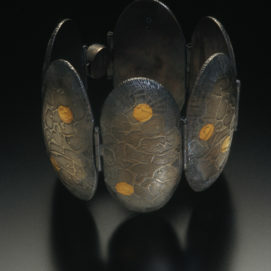 Megan has one-of-a-kind jewelry and metalwork in many private collections around the United States and in the following: The Victoria and Albert Museum in London, England, Washington State's Tacoma Art Museum's permanent collection and in the State University of New Mexico Art Gallery at Las Cruces Gallery's permanent collection. Megan is represented in Seattle, WA at Facere Jewelry Art Gallery. View her work at www.nancymegancorwin.com.